Even a small step to aware people regarding their safety matters to us. By covering the mishap stories, we aim to make people understand that Accidents gives no warning, it happens at the spur of the moment! This month, we cover the mishap story of Shreyash Poudyal, a young and dynamic individual in his own field of work. “ I was a small boy aged eleven or twelve when I started riding bikes. I feel that the passion was inbuilt in me since the early days of childhood itself ”, says Poudyal. Please elaborate the mishap (accident). I remember the day very clearly. I had finished my 2nd last exam and had just one remaining the next day. It was in the morning around 7:30, I went to the parking and started my bike. There are a couple of turns on the way to St. Xaviers and to my misfortune the road was wet due to a water tanker’s carelessness while distributing it to one of the houses. I was going downhill and just as I was about to pass the second turn my rear tyre slipped and then fell down upon me. My leg was trapped by my ride but the sadder thing was the handle fell upon my ring finger which caused a small piece of flesh to rip off. Luckily my friend was coming in his ride behind me and he helped me get up and took me to a pharmacy for the first aid. The injury did not seem so severe at first but as I went to the hospital, I got to know the real scenario. 2. What safety gears were you using during the mishap? As it was a college day, I had a down jacket, a pair of jeans and ironically, I was wearing two pairs of gloves, one was which I bought just the day before. When the accident happened, both of my gloves were shredded on the ring finger. My head also hit the road hard but I had a RJS helmet on. 3. What, according to you, are the most important safety gears and why? There is no such thing as the most important safety gears, all gears are equally important because there is a service center for your bike but there is no service center for your life so it is always important to ride safe. A helmet, a good set of gloves and a pair of shoes are always important. Say no to flip flops. 4. Please share an interesting instance of your riding journeys and how a safety gear helped you. 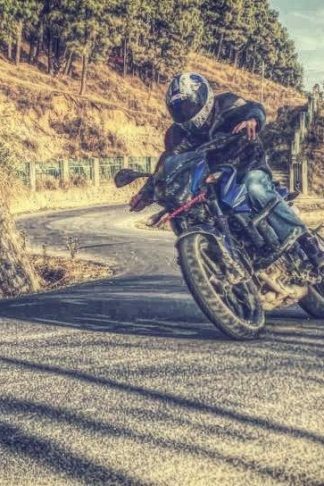 I was on a highway ride returning back from pokhara and my rear brakes were locked and I realized it only moments before I started to lean for a corner. Luckily, I did not face severe injuries but my gloves and helmet surely did a great job to protect my hands and head. I can’t imagine how I would return if my hands would have got injured during the slide. 5. Please give a short message for other riders. We share the same road and it is important to ride safe and slow. Nobody gets to see you when you go fast and everyone thinks of you as a maniac. They all turn their heads to see you crash. Respect the machine and have respect for other riders as well. Most importantly, follow the traffic rules . As truly said by the rider that not just one safety gear is important, we surely can not leave a safety gear behind ! Safety gear should be the first thing in our mind before we take our ride out. Every scar that you have is a reminder not just that you got hurt, but also that you survived !! !